VLC 2.2.2, the second bugfix release for VLC 2.2 series, was released a few days ago. Here’s how to install it in Ubuntu 15.10 Wily via PPA. VLC 2.2.2 “Weatherwax” is the second update to VLC’s 2.2 release series. It fixes numerous security issues, notably in the MP4, RealRtsp and Sparkle modules, but also important crashes for the MXF, ADPCM, Telextext, Skins and Qt modules. More than 100 fixes for issues reported for 2.2.1. Full support of Mac OS X 10.11 El Capitan. For a complete list of changes, see the ChangeLog. The new release has been made into Software Center for Ubuntu 16.04. Below is how to install VLC 2.2.2 in Ubuntu 15.10 using a third-party PPA repository. Type in password (no visual feedback when typing) when it asks and hit Enter to continue. 2. 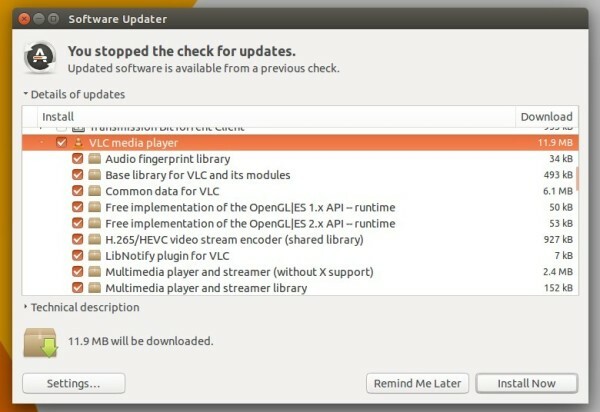 Launch Software Updater and upgrade VLC after checking for updates. If everything goes OK, you may disable or remove the PPA via Software & Updates -> Other Software tab, since the PPA contains many other packages you may not want.